Ginseng, also known as Man's Health, Five Fingers and Tartar Root, is a creeping perennial plant that enjoys the cooler climates of the northern hemisphere. Chinese ginseng, also referred to as Asian ginseng, is native to eastern Asia. American ginseng, as the same suggests, is exclusive to northeastern North America. Both species are harvested for their roots, which are slowly dried and sometimes powdered. In addition to taking either in capsule form, ginseng root is used to make teas and liquid extracts, or is added directly to foods. American ginseng is a member of the Araliaceae family and is an erect, perennial, forest herb with a single stem 20-61 cm (8-24 in.) tall. At the top of the stem is a whorl of 1-4 leaves; each leaf is palmately divided into 3-5 stalked leaflets. Each leaflet is obovate in shape, has a toothed margin, and a narrowly pointed tip. The small, greenish flowers are arranged in a solitary stalked umbel that rises above the leaves. In late summer, the umbel produces a cluster of red, berrylike fruits. The English word ginseng derives from the Chinese term rénshēn. Rén means "man" and shēn means "plant root"; this refers to the root's characteristic forked shape, which resembles the legs of a man. Panax quinquefolius is native to eastern North America, though it is also cultivated in places such as China. Prefers shaded forest habitats, typically the forests have a closed canopy of mature Acer saccharum (sugar maple), Tilia americana (basswood), or Quercus rubra (red oak). Panax quinquefolius does not tolerate habitats that are seasonally flooded, such as might be found along a stream or river, or the edge of a marsh. Wild Panax quinquefolius grows only in well-developed forest soil, typically mesic loamy soil. Sow seed in a shady location in a cold frame preferably as soon as it is ripe, otherwise as soon as the seed is obtained. It can be very slow and erratic to germinate. Transplant the seedlings into individual pots when they are large enough to handle and grow them on in a shady location in the greenhouse for at least their first winter. Make sure the pots are deep enough to accommodate the roots. Plant out into their permanent locations in late summer. Ginseng roots are harvested in the autumn, preferably from plants 6-7 years old, and can be used fresh or dried. Ginseng root is dried in pieces, more typically ground into a powder. Dried ginseng should be stored in an airtight container in a cool, dry place. Advocates say ginseng is the ultimate tonic—a mild aphrodisiac that enhances memory, learning, productivity, physical stamina, and immune function, while reducing blood cholesterol and sugar and minimizing the ravages of stress, aging, radiation, alcohol, and narcotics. Critics say it does little, if anything, except cause a potentially hazardous "abuse syndrome". Ginseng is not one herb but three: Chinese of Korean (P. ginseng), American (P. quinquefolius), and Siberian (E. senticosus). 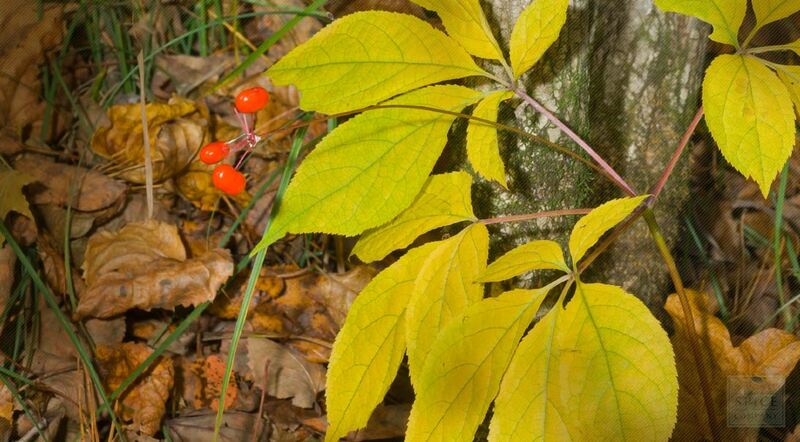 The Siberian plant is not true ginseng, but it contains similar active chemicals, and studies show it has similar effects. As a result, all three are grouped together as ginseng and used interchangeably in the West. 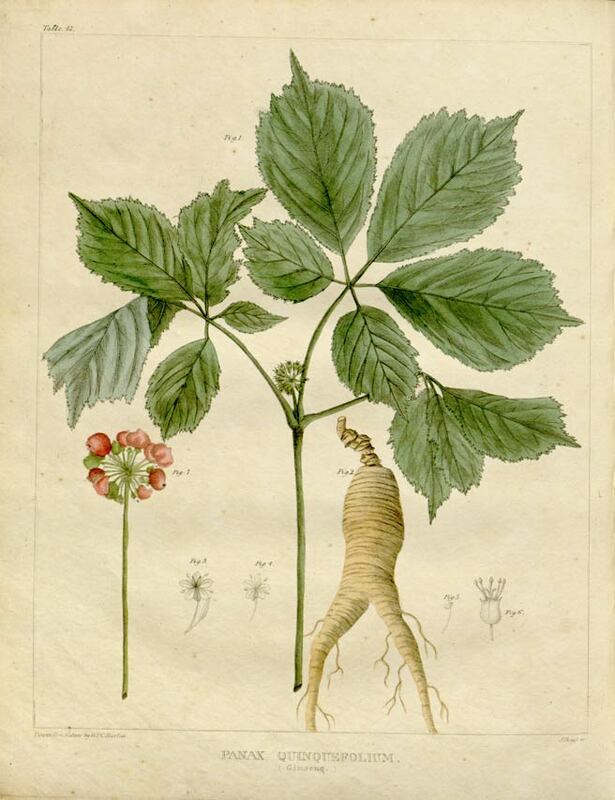 Ginseng figured prominently in the first great Chinese herbal, the Pen Tsao Ching (The Classic of Herbs), compiled by the mythological emperor Shen Nung. Shen Nung recommended it for "enlightening the mind and increasing wisdom," and noted that "continuous use leads to longevity." In China, ginseng's fancied resemblance to the human form led to the belief that it was a whole-body tonic, particularly for the elderly. It was widely used to treat infirmities of old age: lethargy, impotence, arthritis, senility, menopausal complaints, and loss of sexual interest. Chinese, Koreans, and Japanese still consider ginseng the best health promoter. As the popularity of ginseng spread throughout Asia, demand soared and rapacious collection decimated supply. Chinese ginseng became increasingly rare—and more valuable than gold. Unlike other Asian herbs that became favorites in the West, ginseng remained a mystery in Europe until the 18th century, when missionaries informed early European botanists of its reputation as a longevity herb. Europeans scoffed at Asian claims, but those familiar with Asia—particularly the Jesuits who had many missions in China—appreciated the herb's great value there. The American Indians learned about ginseng from the Jesuits and used it to combat fatigue, stimulate apetite, and aid digestion. Some tribes mixed it into love potions. Americas 19th-century Eclectics called ginseng a stimulant for "mental exhaustion from overwork" and prescribed it for loss of apetite, indigestion, asthma, laryngitis, bronchitis, and tuberculosis. Contemporary herbalists echo the Chinese, recommending ginseng as a tonic stimulant that promotes vitality and longevity. They also suggest it for fever, inflammations, colds, coughs, respiratory problems, depression, menstrual difficulties, childbirth, and immune stimulation. Ginseng owes its healing value to several chemicals called ginsenosides. They are not fully understood, and their effects can be downright confusing. For example, some ginsenosides stimulate the central nervous system; others depress it. Some raise blood pressure; others reduce it. These observations need research. But researchers have learned a great deal about this herb and its many effects. Some advocates of ginseng call the herb an adaptogen, a technical term for what traditional herbalists call a tonic. Chief among ginseng's adaptogen advocates is Soviet researcher Israel I. Brekhman, a professor who studied ginseng for almost 30 years at the U.S.S.R. Academy of Sciences. Brekhman wrote ginseng "possesses a remarkably wide range of therapeutic activities...protecting the body against stress, radiation, and various chemical toxins...and increasing general resistance." Counteracts fatigue without caffeine and improves physical stamina. Russian, Chinese, and Korean Olympic athletes use ginseng in their training and before events, and some American athletes have begun using the herb as well. Counteracts the damage caused by physical and emotional stress. Prevents the depletion of stress fighting hormones in the adrenal gland.